How to grow Mint from cuttings. If you follow the steps carefully, I can guarantee that you will get 100% success. Collect Mint cuttings — Buy or borrow mint that have slightly thicker stems. Take the stem tip cuttings by making a cut at 3-4inches from the top. Make sure the cut is right below a node. Do not remove all the leaves. Leave some of them in the cutting, if the bottom most leaf in hindering them you can just remove them off. Prepare the media (in my case coco peat). The media should be moist but not wet. If you try squeeze the media, water should come out little bit. Fill a propagation tray with the media. You can take any container. Propagation tray makes it easier to transplant. Stick the cuttings into each cell and compact it so that the cutting is intact. Now cover the whole setup with a polythene sheet. If your tray is small enough, you can enclose it in a polybag. Transparent cover is good. This step is extremely important. If you don’t cover the cuttings with a polybag, they will lose the moisture and wilt very quickly. Keep the setup in a bright location but not with direct sunlight. No further watering is necessary. Keep an eye on the plants daily. The plants should remain fresh and not wilt. Wilting indicates that the plants are not covered properly in the polybag and is losing moisture. If you properly followed steps 1 through 8, the cuttings should root in just about a week. Once rooted, slowly introduce the plants to the outside world. Since they were in humid environment inside the bag, sudden change in humidity will result in plant going through stress. Expose the plants to sun gradually. First start with an hour and then increasing by an hour every day to harden them. In about 15 days time, your plants will be fully rooted and are good for transplanting. Propagating Hydrangea from Cuttings Growing Coleus from Cuttings – How to grow coleus from cuttings Growing Coleus from Cuttings – How to root coleus Propagating Tomato plant from cuttings – Howto My Greenhouse & Cutting propagation. Hi GG, I have successfully planted mint in my garden but I have a doubt. Every time I harvest mint i.e. pluck leaves to use them in the kitchen, will the stems sprout newer leaves? Or does it mean that for every stem that I pluck, I have to plant a new one. Same query with coriander too. Hi GG.. the post is really helpful. But I have a question, I have started growing vegetables using cocopeat (thanks to your inspiring posts). Can i grow leafy vegetables like palak, mint, methi, dhaniya etc. using only cocopeat? what about the nutritients? can v supply directly as we eat those leaves? or what should we mix if we want to avoid any granules and use unly cocopeat. Thank you so much for the detailed write up. I always did the wrong thing by taking the bottom 4 inches and was wondering why it is not growing!!! But one survived even in that. Lucky me!! Your mint looks so fresh. And it’s really very impressive to see how you get your 100% success rate. When I first tried growing mint, I’d failed. The reason was I’d used quite a bit of my super-nutritious compost in my quest to have more mint. 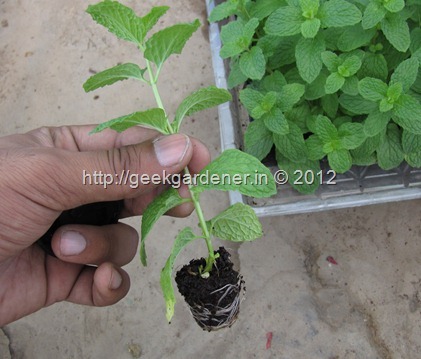 Now I know that mint can do well in poor soil and can very easily get burnt with compost/fertilizer. Hope you are doing great…. Its been very long that I last talked to you… I have moved to California now… and have completely stopped on gardening(hoping start again this summer). However, I follow your article very closely. Congrats on all your recent achievements. Good work buddy… happy gardening.. I did all of the steps but I never got any mint cutting to root. I stay in mumbai and here when you wrap any moist thing in plastic, it is attacked by fungus within 2 days. After few days all the leaves blacken and fall down. The stem also becomes hollow. Could you suggest any way in which I can avoid this problem.I have been trying since many months for mint. Sorry to hear that they havent rooted but rotted. 1. Soil/media is already infested with fungus and reusing them is a recipe for failure. 2. For rooting the cuttings, you need not add any compost or anything. Just cocopeat is good enough. Once rooted they can be transplanted. You can also root cuttings in sand. If you ensure, the above mentioned things are taken care. Growing herbs is a natural choice, besides being able to enjoy much fresher herbs than what you might buy at the super market, herbs are a fantastic choice for someone who is new to organic gardening because they are typically much easier to grow than other plants. I bought a bunch of fresh mint from Reliance Fresh Mart in Mumbai. I took a small bunch and put in a plastic glass filled with water and left it near a window site. I keep changing water regularly and have noticed roots develop in about 4 days. You need to leave it for 2 weeks for the roots to develop fully for transplanting on to to soil. Also tried to transplant a few directly in to the soil, but they withered and died, so I am happy that the first approach succeeded. that was a wonderful write up.i am trying to propagate mint in the manner suggested by u.thanks to u i too am trying to grow a few vegetables in my balcony, though i am facing few minor problems .my coriander does not grow tall enough.after a few leaves it flowers.The plants are weak in general though they look quite healthy on germination. as they grow they start looking lanky.what could be the problem? another problem is with my chilly plant.it has grown quite well and is bearing flowers.but after the flowers dry out i fail to see any chilly on them.the plants are quite healthy.how many days does it take to bear chillies after flowering? I have the same problem with coriander. 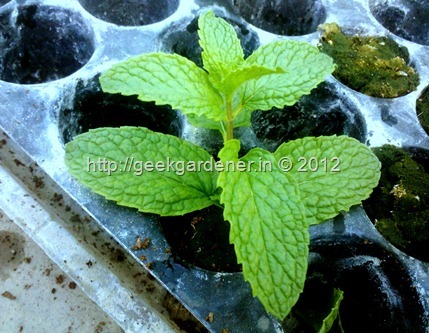 As far mint goes – i propagated it successfully using this method a while back. however, the leaves are getting thinner and thinner and it does not look at plush. I have removed some of the roots; any idea what could be other problems? covering them properly is the most important task.. and a place for good light.. I stumbled on your blog couple of weeks ago and it inspired me to take my balcony gardening more seriously. The tip about keeping the mint covered worked very well and I have managed to get one started in a pot. Thanks a lot. Thanks for the valuable information. I bought mint from local store, and tried to root it by keeping it in water for 5 or more days. They din’t root at all. I had removed the leaves from the stems before putting in water. Was that the right thing to do? I had tried some with leaves too, but no luck. I will try your method now and see how it goes. 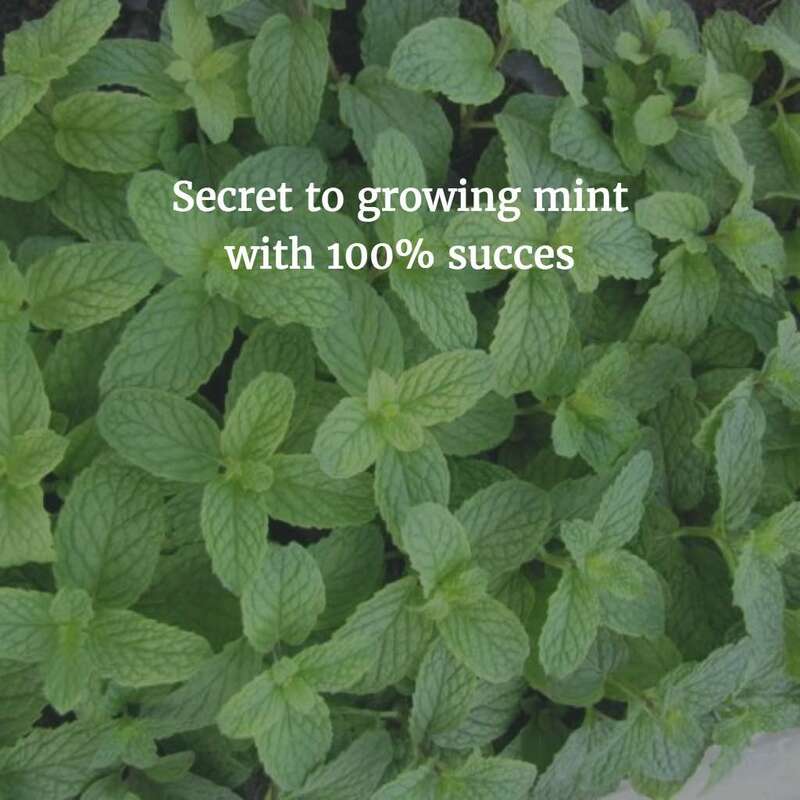 How much water does mint take? Thank you for this post. I was able to start my mint going very easily this way after several unsuccessful attempts earlier. I am eager to know from Ashok: Whether the mint plant is still in water? Is the plant healthy? Howabout the nutrition requirement? I will try and get a few pictures and post a Picasa link and request GG to upload on his website. Thanks to GG for this great website and source of knowledge for newbee’s like me. So happy to see the comment. Glad to hear that you were able make cuttings this way..
1. Where would I find propogating trays? I have been trying to find them for some time now! Your help would be highly aprpeciated!! Terrific. Grew 32 mint plants as per your advice and all of them have been transplanted and thriving well. Kudos to you. 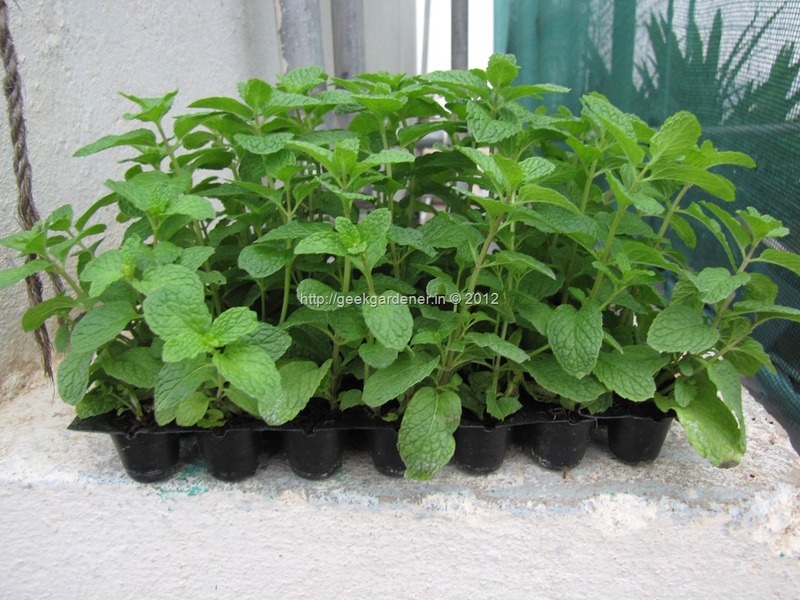 As suggested,I have grown mint – Fudina. This is growing well. Thanks – GG for presenting in a excelleny way. I was willing to see your terrace garden but my programme to visit Bangalore was cancelled. I am always looking or say waiting to hear new news. Very happy to hear that my method of growing mint is effective.. I would like to invite you to follow my blog, Gardening Upstream. Thanks for the invite. Your blog is nice. Sir, I don’t have a propagation tray, can i use a plastic tray, to propagate mint? should i make holes at the bottom of the tray? you dont need a propagation tray. you can use any pot or tray and definitely you should make drainage holes in the tray or any container for that matter. Thank you. I am growing okra in pots. Last season, I was very successful in growing them. But this season, I found the white patches, under the leaves, almost on all okra plants. After seeing your article, on growing okra plants, I sprayed neem oil with dish soap. Should I rub these white patches, with a tissue paper or just leave them as it is? Thank you very much for the information since I came to know about you only recently through one of my nieces.Though I had tried many times to plant mints I could not do it successfully. Now I am confident that I can do it.I have started gardening and will be following your valuable instructions in future. Should we use a propagation tray only to plant the stem cuttings? Can I directly plant these in the pot / container? I followed ur method for growing mint, its good, Thanks! I would like to grow cauliflower for the reason which is high in pesticides. with poison’, Is it safe to use? 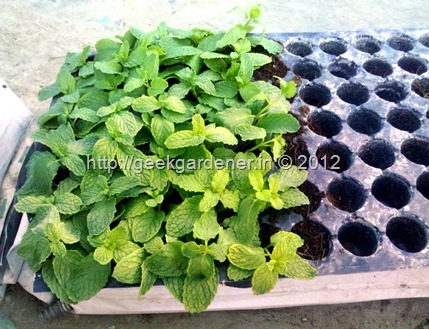 I have tried mint several times by directly plant only the stem without the leaves in the pot. everything withered away. I will try this method of yours. should i be keeping the mint in the watre with the leaves or just the stem? hurray…I had used tissue paper to plant the cuttings…and the roots are formed. (Today is the 7th day). I have transplanted the saplings. Keeping fingers crossed. I stay in Mumbai and obviously we do not have enough space to live let alone garden.. I do not even have a terrace.. I am keen on having a home garden and need to start with the basics. How do I go about it. I am very keen on growing Vegetables/Herbs and fruits..
You can use a paper egg carton as a tray. If you have problems with fungus in your soil, you can bake it, especially if it is fresh compost. Do you sell the propagation tray at gardenguri.com? Nice blog. I read about cocoa peat in ur article, we have coconut trees at home and can I use those dust from coconut while peeling the shell of the coconut instead of cocoa peat? Can I put the plant in a plastic baggie and seal it instead of putting plastic over th top? I have started my cuttings following this method. After the plants have been under that bag for a week and show growth/health how often should you water them? Especially as I introduce them to more light, do they need to stay moist or start to dry out? And after transplanting ( in my case, after they get used to the sun) can they be watered normally from then on? This article on probagating mint from stem is very interesting and useful also. Is it necessary to cover it with plastic sheet? Thanks. Covering with a plastic sheet helps to retain moisture and humidity. This retains the freshness of the plant. They root almost in 3 days time. I took cuttings from the strongest ones and obeyed your rules. Got two of the cuttings growing. But there leaves are tiny. May be 1/4 of the regular ones. Will you able to help me out here? Any idea why leaves are small and how to get it big? Looking forward to your help. Thanks in advance. Several times I did not succeed in planting the Mint and get good crop. After going through this article, I was able to get it proper and am very happy. In fact, I am following GG in various other plantings also. Thanks to GG for this article. I recommend following all the good advice given here on this site. But for those who may not be so avid to do so, like myself, I can attest that just taking cuttings and throwin’ them in a pot of soil has, for me, proven to be successful almost all the time. 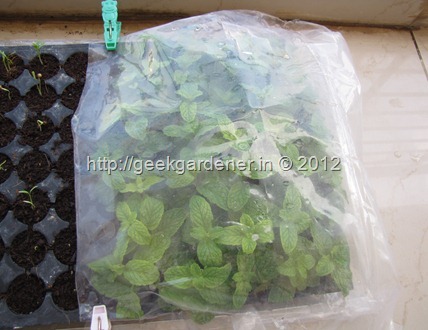 Should I seal the cuttings with polythene or I can leave some gap for it to breathe. Mints are invasive when planted together, but I dont think they grow to such an extent the other plant dies. Perhaps there is someother issue?